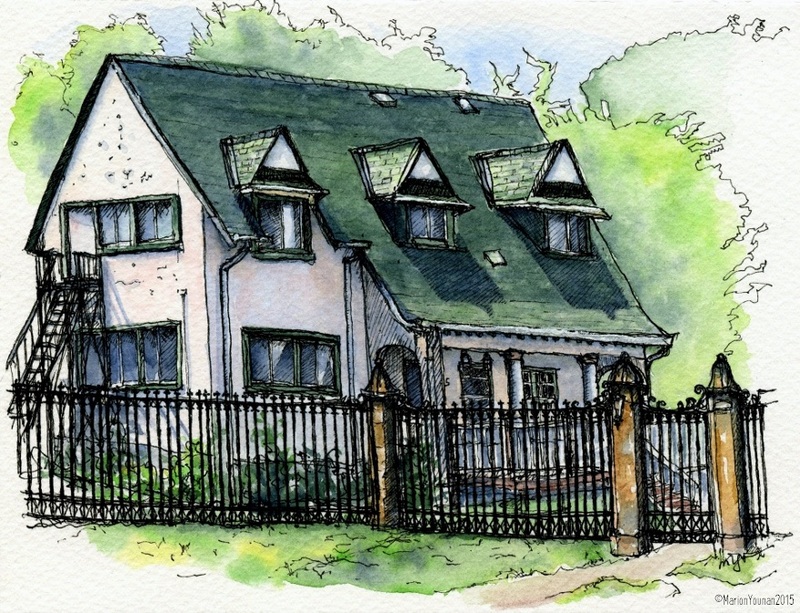 As I mentioned in an earlier post, the Toronto Urban Sketchers have a summer project underway sketching historical landmarks in the Toronto area that are to be demolished or are in danger. We’ve been keeping an eye out for newspaper stories, city documents, and Internet postings about these buildings, and have amassed quite a list. A few Sundays ago, I headed out to midtown to sketch a few of these buildings. Turns out that only one of the buildings I chose to draw is truly slated for demolition, and the other is under new ownership (which raised a question about its future) but has just been restored. The Fieldhouse was completed in 1924 and is a heritage site on the campus of De La Salle College. It was started in 1908 for the guard who watched over the estate’s gates (1860; seen in the drawing), but was expanded. Today it’s the college president’s residence, but is soon to come down for townhouses. 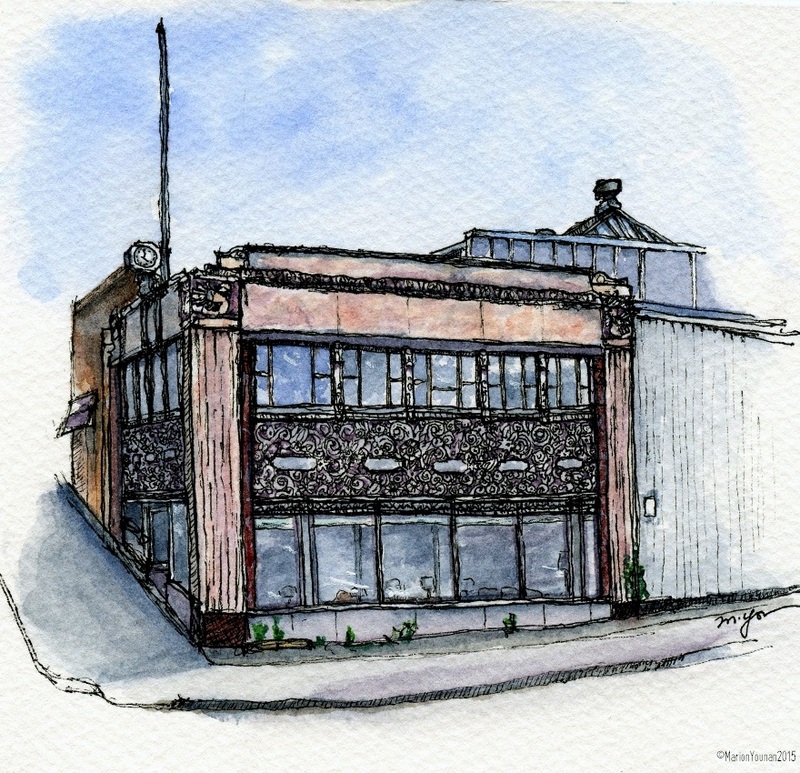 The second building I drew this day was the old Consumers Gas Showroom built in 1930 in full art deco style. The building’s exterior has this amazing carved (or cast) stonework of flowers and swirls. It’s quite gorgeous. And in speaking with a gentleman inside the building, it’s not likely under the new ownership to be touched. While I was sketching, a woman stopped beside me on the sidewalk, watched me drawing for a bit and then just gazed at the building. She finally said “It’s really quite beautiful. I’ve never stopped to look at it before.” So cool. Exactly what I’ve discovered about our world when sketching it! Hopefully I’ll get out to sketch more of these landmarks. And if you’d like to see more of what the Toronto Urban Sketchers are up to, check out our Facebook page or blog page. Fabulous work Marion, your drawings are exquisite! What a wonderful way to document our changing city and value our heritage. Your drawings are beautiful! I like the look of your blog!!! Keep up the great work!